All around the country, high school students are graduating. Throwing off the shackles of childhood and becoming adults. Getting ready to take the next big steps in their lives. As much as the graduation ceremony is a pain for teachers (we get to haul the chairs out, stay late after school, put on silly outfits, and smile at everybody we see), it’s kind of awesome, too. Far be it from me to attach symbolism where there is none, but there’s something about seeing the students dressed up in their caps and gowns and tassels and stoles that somehow washes away a year (or more!) of silly behavior in a classroom and makes you think they’re going to be all right. Still, they’re not done yet. Like a cake being checked by an overzealous baker, they need to cook a little longer. And as anybody over the age of thirty can tell you (with no hint of doom and gloom at all, naturally), it only gets harder from here. Whether it’s college or the armed forces or an early entry into the school of Real Life, it will quickly become apparent that high school was a milk run. So, a double-edged bit of advice for anybody on the cusp of a great thing: Don’t be afraid to brake, but don’t break. First, don’t be afraid to break. The sharknado happens fast in this world, and as Ferris Bueller said, “if you don’t slow down and look at it once in a while, you might miss it.” It’s true: the time seems to constrict around times of great import. The last few weeks of the semester fly by. You just can’t stop writing (or reading!) when you get to the end of the novel. And deadlines never approach so fast as when they’re right on top of you. Before you know it, the next thing will be here, and while it’s easy to shift your focus from what you’ve just finished and go straight into worrying about the next thing, don’t forget that there’s life happening everywhere all the time, spilling out of the cracks and gaps in your schedule, oozing out around the corners of all the things you have to do to get ready. Pump the brakes. Slow down for a minute. Enjoy and appreciate the world around the outside of everything that has to be done. If you don’t take time to slow down like this every once in a while, you’ll burn out and lose the drive to do even the things that matter to you. But that brings us to the second part: you can’t break for too long. This country is built on towns that sprung up when people headed out west broke down and never got started again. And don’t tell me your goal was to make it to Kansas. (Sorry, Kansas natives. Your state is even boringer than a blank sheet of paper; at least you can write or draw on a sheet of paper, or fold it into a totally sweet airplane. All you can do in Kansas is drive through it for hours, never sure if you’re actually making any progress.) Your momentum in life matters, and if you don’t get moving again soon, inertia will swallow you like a black hole and you’ll find yourself sucked into the gravity of the same old path of least resistance. Pull over for the pit stop and look around, but know when it’s time to get moving again. In short, enjoy the summer after your graduation — or a week or two of rest after finishing that big project — or whatever it is that you need to recharge your batteries before you move on to the Next Big Thing. But then, get moving toward the Next Big Thing, before it drives on down the road without you. I started out writing a post about how the boy in this picture is all of my students right now. Then I realized that the boy in this picture is actually me right now. Then I took one last think on it and it struck me: the boy in this picture is all of us, all of the time. We’re all making this sharknado up as we go along. Nobody knows what the hell they’re doing. We hope we’re doing the right things, and we certainly like to think that we’re doing pretty good in that regard. But running like a river of slime just below that shiny, smiling surface, is a bubbling, broiling river of doubt and despair, and you never know when it’s going to flood its banks and cough up a clutch of dead raccoons on your perfectly manicured lawn. I could watch that little boy’s face collapse for hours. I’m sitting here watching The Many Adventures of Winnie the Pooh with my kid. You know, the one from the 70s that’s less a movie and more a bunch of cartoon shorts slapped together with honey-flavored caulking. Now, there’s a lovely little book that came out some time ago called The Tao of Pooh, which takes the silly old bear and infuses him with all sorts of Zen mysticism. (Actually, the mysticism was in him all along, we just didn’t always realize it.) And that book has a companion called The Te of Piglet. Fantastic reads that you can pick up and put down as often as you’d like; the kind of books that grow with you. The kind of books that mean something entirely different to your full-of-piss-and-vinegar twenty-something self and your tired-as-fargo-from-wrangling-toddlers-all-weekend thirty-something self. But I realized, watching the cartoons just now, just this instant, that you don’t need a zennified book to appreciate the dubious wisdom of Pooh. The beauty is in the simplicity. And as a writer, the simplicity resonates on several levels. Let’s take the opening short. We meet Pooh in his house, and Pooh wants some damn honey. Why? Because he’s a stuffed bear, and fargo your reasoning; his honey stores in the house are empty, so he’s got to go get some more. But he doesn’t have a grocery store with a plastic bear full of honey to overpay for; he’s got to go straight to the source. Who makes honey? Bees do, so Pooh goes after the bees. He climbs a tree and tries to just straight-up jack some honey, but the bees aren’t playing that, and the twiggy brances at the top of the tree can’t support his honey-eating behind, so he falls all the way back down. Is Pooh discouraged? Not for a minute. Along comes his pal, Christopher Robin, with a balloon of all things, and Pooh says, hey CR, let me snag that balloon so that I can use it to get some honey. CR is no fool, and he asks the question that we’re all asking, watching this: how are you going to get honey with a balloon? Don’t be silly, says the bear, I’m going to use the balloon to float up there. The bees will think I’m a raincloud, and they’ll let me have the honey. Now, this is patently idiotic, and being a good friend, CR points this out to him — you don’t look like a raincloud. Right, says Pooh, let me roll around in some mud so I’m all dark like a thundercloud. So he rolls around in the mud for a minute, gets good and disgusting, then floats up to the treetops. This works until the bees realize that the bear is ganking their honey again, so they attack him and he ends up falling all the way down again. Bees aren’t parting with their honey, he realizes, and goes off to his buddy Rabbit’s house, where he just asks for some honey without any niceties or prelude. And Rabbit gives it to him. Gives him so much, in fact, that Pooh can’t even squeeze his honey-stuffed stuffing out through the door anymore, and he has to go on a two-week diet before he can even go home again. Let me not spoil the whole program for you if you haven’t seen it, but suffice to say, the shenanigans continue. All are ridiculous and wholesome, and all are approached with the same oh-well-I-guess-if-that’s-the-way-it-is-we’ll-just-have-to-change-the-way-we-think attitude. So why is this relevant to the writer? 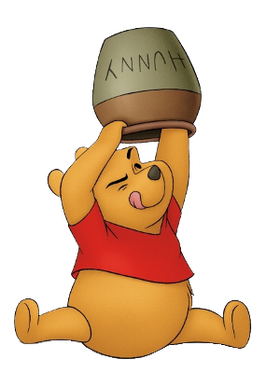 Pooh wants honey and he sets himself to the task with the single-mindedness of a cat stalking a crippled lizard. He tries the direct route. When that doesn’t work, he doesn’t just think outside the box, he turns the box inside-out. When that doesn’t work, he dispenses with the pleasantries, doesn’t hem and haw his way around it, he just goes to somebody who can help and gets some damn help. In short, once he decides he wants it, there is no force on earth that is going to stop him. So it must be with the writer. Sometimes the direct route is all it takes to get us there, but more often, the direct route is a boring and ineffectual route. We have to get outside the box. Sometimes that means redesigning the box, burning it, designing it again, throwing it down a flight of stairs, and building another box from the shattered pieces, then stepping into the box just for the purpose of stepping back out of it. And sometimes, we just need a little help. Many times I’ve read the nugget of writing advice: “keep a notepad by your bed, so you can jot down the ideas that come to you in your dreams!” Which is the sort of nebulous, tree-hugging crap that sounds good at first. We don’t know where inspiration comes from, and we don’t know where dreams come from, so obviously they must come from the same place, right?? I’ve tried it. My results are less than stellar. Less than atmospheric, really. The trajectory of my success with this method is more like a Greyhound ride to Denton: disappointing, a little smelly, and at the end of the day, you’re in fargoing Denton. Sure. Maybe. But dreams are boring as hell to anybody who isn’t you and who isn’t bound by genetics or marriage vows to listen to you. And dreams aren’t compelled to make sense or be coherent at all. I dreamed early this morning of a sort of Titanic-esque love story. Two people from different worlds collide on this boat that’s going away forever. Romance. Goofy frippery. Elaborate costumes. But the dude is found out as a fraud by a snooty guy who goads him into a fistfight and gets him thrown off the boat. Dude is losing his mind with love and the thought that he’ll never see his girl again. He tries desperately to get back on board, and ends up swimming out into a shipping lane in hopes of getting scooped back up. He does — by the Coast Guard, and his persecutor takes great pleasure in locking him up for international crimes or something. But our dude manages to win over the persecutor’s grandmother with the power of his love, and she convinces her grandson to stage an elaborate shenanigan (shenanigans can be singular, can’t they?) to stop the boat and allow the dude back on board, where he is tearfully reunited with his love. Terrible. And that’s a salvageable dream, with a beginning, middle, and end, kind of. Never mind how the guy got out into open ocean to swim into a shipping lane, although that’s arguably the best part — maybe he could get mauled by the propellers of a cargo freighter hauling prosthetic limbs. As dreams go, this is a masterpiece of continuity. It’s awful, but it’s vivid, and because it’s vivid, and because that little turdlet of writing wisdom is still kicking around in my brain, I wrote it down. So, now, I can ignore it as I flip past it when I go plumbing the depths of my drivel looking for inspiration for my next work. But here’s the real problem with waiting for inspiration from your dreams (though it’s more of a skeptical hangup than a problem). If it’s kicking around in your dreams, that means it’s already banging around in your subconscious, which means on some level it’s something you’re already thinking about. The dream just brought it to front-of-mind for a fleeting moment while you were unconscious. With that in mind, it’s hard to say that just because I dreamed something, it’s automatically worth writing down. Like most of the thoughts that pass through my head, anything I dream is actually probably not worth writing down or remembering at all. Dreams shouldn’t get preferential treatment over any other old crusty idea that drops into your brain. If anything, they deserve more skeptical treatment by dint of being disjointed incoherent heaps of hot garbage. Dreams, just like any other idea I have, go through a rigorous screening process. Just like I don’t pick up the phone for phone numbers I don’t recognize, I don’t write down an idea as worth keeping just because it popped in there. Most ideas are crap; dreams, doubly so. But you’ll know the good ones when you see them: The good ones will stick around, call back, or even show up on your doorstep to make sure you pay attention to them. The good ones will stick in memory whether you write them down or not. I’ll be honest, as I’ve been in the past: I have no idea what I’m talking about. I’m making this all up as I go along. All of it. Life. Fathering, writing, teaching, running, husbanding… you will find no stores of expertise here, and precious few pearls of wisdom in a heap of dusty crumbs of idiocy. But you’ll also see that that doesn’t stop me from pretending. I use this blarg all the time to talk about things I pretend to know a lot about. I dispense all sorts of marginally intelligible writing advice, I wax eloquent about the virtues of distance running, I tell funny stories about baby poop that hint at, but never actually deliver, profound lessons about life. Why bother doing all this, when I’m not actually a writing guru, not actually a running yogi, not actually a SuperDad? Because I want to be those things. But here’s the trick: you don’t get to flick a switch and start being those things. The road from where you are to where you want to be is beset on all sides by the iniquities of the weak and the tyranny of evil men. (Or maybe that’s only if you’re Samuel L. Jackson.) Oh, you want to write? There are thousands of writers out there. What makes you think you’ll make it? Good point, you think, and give it up, wisely saving your efforts for more productive endeavors. Oh, you want to start exercising? What’s the point? Most people fall short of their exercise goals and give it up anyway; you might as well hang it up now and save yourself the heartache. Too right, you think, and cancel your gym membership. But where do those voices of doubt and dissent come from? Sure, there are haters out there that will poop on your dreams and ask you to thank them for it, but the louder, more convincing voices are the ones in our own heads. I know I can speak for myself when I say I’m my own worst critic. The voice in my head that tells me I can’t do things speaks like Morgan Freeman with a 50,000-watt station broadcasting down to the very marrow of my soul. It’s overbearing, constant, undeniable. How do I overcome it? I’m not an expert writer, but I can pretend to be one. And I can bang out over 1,000 words a day on average despite my full-time job and part-time daddy duties as if I were an expert writer. And I can shovel out advice like a steamshovel about my experience and pretend to know what I’m talking about to give the illusion that I actually do know what I’m talking about. Because that’s what experts do. They look confident. They walk the walk and talk the talk. You wanna be that thing? You have to start doing the thing. Nobody’s born a brilliant novelist. No athlete pops out of the womb running ultramarathons. The people that do those things have the same voices of doubt that you or I have. The human experience, for all its vast variations, striations, complications and salutations (whatever, I ran out of good rhymes), is actually pretty standard. We get a life, we get some challenges, and we either overcome them, or we don’t. If you want to get ahead, you have to learn to be a con man. But not so that you can run a swindle on some unsuspecting rubes. (Though I guess that helps, too.) The con you want to run — the long con that you work for years and years — is on yourself. You have to fool that inner voice of doubt into believing that you’re not to be doubted anymore. You have to fake it til you make it. That means pretending to be the thing you want to be, every day, in public and in private, until one day it’s no longer a con and you are that thing. Wanna be a writer? Write buckets of garbage. Drivel, drivel, drivel. Pile it on and pile it on and write boring stories and hackneyed narratives and cliched tripe and nonsensical dialogue until one day, when you’re not even thinking about pretending to be a writer anymore, you’re simply writing because that’s what you do now, you write something and it’s not half bad, and your inner voice of doubt will say, as if you’ve just demonstrated that the world is not, in fact, flat, as he previously believed, “oh. Well… I guess that makes sense, then.” And BLAM KAFIZZLE, you’re a writer. Wanna be a runner? Get outside and run until you can’t anymore, and then stop and walk home. Then do it again. And again. And again and again and again, until you can run for a mile, and then for two miles, and then one day you’ll be out for your daily torture session, except you’ll realize it’s not actually torture anymore, it’s rather enjoyable, come to think of it, and you’ll start looking forward to those runs. And when people ask you what you’re doing this weekend you’ll respond airily, with a casual wave of your hand like you’re just going out for eggs, “oh, I’m going out for a 10k this morning,” and they’ll be all like “whoa, you’re running in a race?” and you’ll be all “no, that’s just what I do — I’m a RUNNER NOW.” And you’ll stomp on their toes for emphasis. Or maybe not. The stomping is optional, though it sends a good, strong message. Point is, all the old adages are true. If you believe you can or you believe you can’t, you’re right. A thing always seems impossible until it is accomplished. You have to fake it until you make it. The power of sticktoitiveness (not a word, but yeah, totally a word I love) cannot be overstated. If you wake up every morning determined to accomplish a thing, and then take the steps and do the work necessary to take one step on that journey EVERY DAY, you can get there. But what do I know? I’m not an expert. I’m only pretending to be.